to a Celebrated Musician in Charlotte NC. In this musical memoir, Renato P. Escarcha chronicles how a life he had at first intended to be of service to God served as a preparation for an unexpected twist of fate. Rene discovered, during his years in the seminary, his passion in playing the guitar and in song-writing, inspired predominantly by the world-famous cultural icon - Elvis Presley. 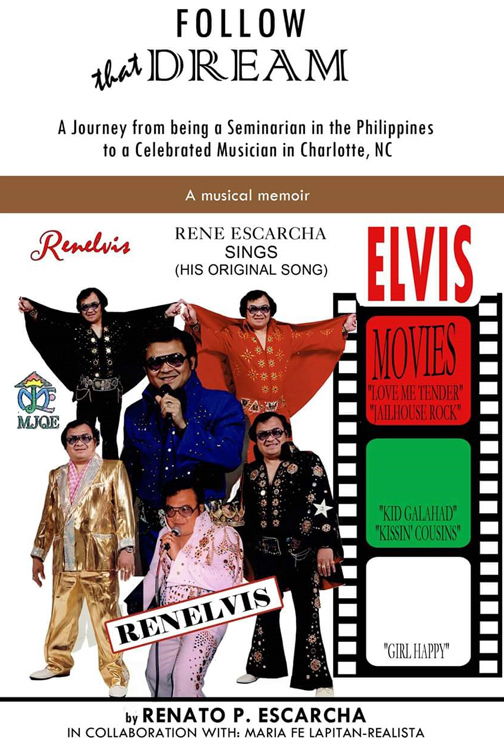 Back then, Rene never predicted that when he settles in "the land of milk and honey" (as he wrote in his original composition "Western Land"), he would become Renelvis, the Charlotte-renowned Filipino Elvis impersonator. Creative Loafing music director Fred Mills once wrote, "If you close your eyes, he takes you to front rwo center at the Elvis concerts of your memory," referring to no other than Renelvis. After his wife Esperanza died of cancer in 2005, Rene has been the sole caretaker of their only daughter Josephine, who has special needs. Rene considers Jing ner muse and lucky charm. Now having accumulated at least three dozen Elvis hand-made jumpsuits and having performed in over 500 shows in North Carolina and a few other states, the enthusiastic Renelvis still sees himself more as a song writer than a singer, which he hopes his audience will finally see. The last two chapters in this memoir showcase the songs in Rene's released albums.